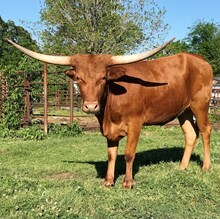 Gretchen is out of one of our favorite cows, Grettal BCB, who had beautiful, lateral twist horns. While Gretchen did not get all the twist from her dam, she does have wide, outstretched, high horns measuring 74" tip to tip and a tremendous amount of total horn. Gretchen is gentle, easy to work, and raises great calves.